Owen Jones and Paul Mason are widely considered to be the UK’s pre-eminent left-wing commentators; both appear frequently on television and radio, write regularly for mainstream publications like The Guardian and The New Statesman, have had books published (and subsequently translated into multiple languages) and attract enormous followings on social media: as of August 2018, their Twitter accounts have 742,000 and 597,000 followers, respectively. By many of their detractors on the right, Jones and Mason are depicted as socialists and radicals, members of what is referred to dismissively in the UK as the “looney left.” Indeed, both men claim to be socialists and Marxists of some kind themselves. However, what becomes clear upon a sober analysis of their positions on a wide range of issues is that they are in fact distinctly un-radical, frequently opportunist in nature, and particularly in Mason’s case, openly reactionary and imperialist. This article will focus on some of the most egregious of these views and examine what it means that they are able to express them without significantly damaging their career as professional ‘leftists’. In addition, since Jones and Mason are merely the two most prominent examples of what is a more widespread phenomenon, the broader implications of their esteemed standing on ‘the left’ are also considered. As shall be made clear below, this is not a question of petty squabbling, sectarian infighting or demanding ideological purity but rather, relates to fundamental questions around solidarity with colonised peoples, principled opposition to imperialism and a willingness to defend embattled Communist governments—past and present—from dishonest and ahistorical attacks. Jones’ position on Palestine is an illuminating point of entry into this discussion as it is symptomatic of a broader trend concerning the often stark contrast between the perception and reality of his stances. Jones positions himself prominently as a “passionate supporter of Palestinian justice”; he speaks at Palestine-related events and regularly writes social media posts about the cause that are then shared many thousands of times. But beneath this veneer of solidarity, Jones opposes the Palestinian Boycott, Divestment and Sanctions [BDS] movement. Speaking to The Jewish Chronicle in April 2017, Jones declared that he does not support BDS as it could “end up indiscriminately targeting Jewish people,” an inherently flawed position that conflates BDS’s call for a boycott of Israeli institutions and companies with individual “Jewish people.” This argument, one that is frequently used by Zionists to falsely portray BDS as anti-Semitic, is debunked by one of the movement’s co-founders, Omar Barghouti, in the following clip, in which he also explains cogently how—through its conflation of all Jewish people with Israel—opposition to BDS on such grounds is anti-Semitic in itself. To support his argument, Jones claimed, in an unevidenced assertion, that only one percent of the Jewish community in Britain do not describe themselves as Zionists, yet according to a City University study the figure is actually 31 percent (with a further 10 percent undecided). In doing so, Jones effectively erased the voices of tens of thousands of British Jews who do not identify as Zionist. In fact, Jones’ duplicity on Palestine extends beyond his opposition to BDS and use of inaccurate statistics, as he has openly cooperated with groups working against the Palestinian cause. this video report on suicide and mental health in the territory; this article by Saree Makdisi on the overtly “genocidal intent” of the architects of Israel’s policy towards Gaza; and consider Hajo Meyer’s thoughts on the parallels between his experiences in Nazi Germany and those of the Palestinians today. Since speaking at the JLM event, Jones has repeatedly ignored questions from the Palestinian campaigner and writer, Ali Abunimah and many others, as to whether he will offer his support to BDS. In December 2017, Jones declared: “Solidarity with Palestine. One day you’ll be free, and history will damn those who stood in the way.” It is not a question of demanding ‘ideological purity’ to note that performative solidarity such as this appears to be little more than self-promotion so long as Jones opposes the largest international pro-Palestine movement on spurious grounds. BDS is not the entirety of the Palestinian struggle and it must never be forgotten that the right of the Palestinians to pursue armed resistance against Israel’s military occupation is mandated by international law. Yet it appears undeniable that the momentum of BDS is growing and a figure with Jones’ huge reach endorsing it would undoubtedly serve to boost this trend. Sadly, not only does Jones refuse to support the movement, but he has collaborated with those fighting against it. Evidently, Jones wants the acclaim and leftist credentials that being seen to support the Palestinian cause provides, but is unwilling to risk the damage to his reputation and career that endorsing BDS could entail, notably if he were to stand as a Labour Party candidate in the future. As we shall see, this lack of principle and opportunism is not an isolated case—on the contrary, it is illustrative. In March 2018, to much praise on social media, Jones lamented, “Why are the politicians and pundits who brought us Iraq and Libya still treated as statesmen and sensible hard-headed pundits?” A legitimate criticism indeed; many figures who should be disgraced are instead legitimised and rehabilitated in this manner. Two months later, Jones expressed a similar sentiment regarding Tony Blair, describing him as “that eternal reminder you can help invade a country, with hundreds of thousands of deaths, millions of displaced and injured and the rise of fanatical groups…and still be treated as a statesman by the British media.” Another prominent example of this shameful trend is Blair’s former consigliere, Alastair Campbell, a central figure in selling the illegal war of aggression against Iraq who was intimately involved in the compilation of the infamous ‘dodgy dossier.’ So intimately, in fact, that David Kelly revealed to the BBC that it was Campbell who inserted the invented claim that Iraq could deploy weapons of mass destruction within 45 minutes. Two months later, after being outed as the BBC’s source under pressure from Campbell, Kelly was found dead in suspicious circumstances. Campbell was also responsible for the inclusion of the absurd claim that Iraq “could produce nuclear weapons in as little as a year.” In short, Campbell knowingly used fabricated evidence in order to justify a war that by 2006 alone had killed over 600,000 Iraqis, and as this article makes clear, according to the principles established at Nuremberg, he should be prosecuted for “complicity in the commission of a crime against peace … a crime under international law.” However, since then, not only has Campbell avoided facing justice, he has managed to reinvent himself as an elder-statesman type figure, media personality and motivational speaker. If Jones followed his own advice and applied his disdain for Blair consistently, then of course he would shun Campbell entirely and encourage others to do the same. Yet in reality, on two separate occasions, Jones has happily sat down in interviews with Campbell and, to use his own phrase, treated him like a “statesmen and sensible hard-headed pundit.” Whatever Jones’ intentions were, legitimising Campbell in this way directly contributed to bolstering his status as a legitimate media figure, rather than the unrepentant criminal that he is. The first interview, for GQ Magazine in April 2017, makes for excruciating viewing; not only is Jones shown up more than once, but at times, he appears in awe of Campbell and treats him deferentially throughout. Jones even explains to Campbell that he had agreed to do the interview despite knowing he would be criticised, since he thought it would be “interesting to have a chat,” and he laughs as he describes Campbell as a “demonic presence for lots of people on the left.” Once again, Jones responded to criticism of his decision dismissively and did little more than moan about a “very noisy and very obsessive group on the left” attacking him, as though any objections raised to his role in Campbell’s rehabilitation were unreasonable. When Jones criticised the media for embracing the “politicians and pundits who brought us Iraq and Libya” he also decried that “it’s the same…every time. Iraq, Helmand Province, Libya. Anything other than total subordination to the government line invites accusations of being a stooge for Saddam/Taliban/Gaddafi … [a]ll dissent has to be bullied out of existence.” He claimed to be “sick to death of the determined silencing of any dissent by a political elite and commentariat which *every* *single* *time* demands unity and silence at times of a foreign-related crisis.” Of course, Jones is correct that dissenting views are treated this way. Indeed, it is a technique that he knows well, as he has used it regularly against those who disagree with him. This explanation strikes at the heart of the issue, for by agreeing to be interviewed by Campbell for GQ that is exactly what Jones had done. Yet because his mainstream credibility and standing would not suffer through association with Campbell, he was glad to be interviewed by him in return for the attention and rise in profile that participating in such interviews offers. Evidently annoyed by my questioning, Jones then told me to “drown in my own spittle” and dismissed me as a “tyrant apologist.” In other words, Jones used exactly the kind of language that has been used since 2011 to intimidate any dissenting voices regarding the mainstream narrative on Syria, a topic I wrote about in detail four months before my interaction with Jones. Ironically, almost exactly a year after this exchange, on the morning that the UK took part in illegal airstrikes on Syria, The Times ran a front-page article attacking a working group of academics (of which I am a member) as “Apologists for Assad.” Essentially, Jones has helped to foster exactly the kind of toxic public discourse regarding opposition to war that he ostensibly opposes. Indeed, when it comes to issues of war and imperialism Jones frequently endorses the state narrative, accepts the spurious humanitarian rationale provided for intervention and then, seemingly for the sake of maintaining his leftist credentials, argues that in spite of it all, intervention should still be opposed. Libya is an illustrative case, for while arguing against intervention in March 2011, Jones declared “[o]ther than a few nutters, we all want Gaddafi overthrown, dead or alive” and spoke glibly of the possibility that the Libyan leader could be “Ceaucescued” on television. Even if Qaddafi had not actually been tortured and murdered on camera just a few months later, Jones’ words would have been distasteful and revealing. Given how things transpired, they are abhorrent. Jones also refused to condemn those who supported the intervention, stating: “I will not caricature supporters of the bombing campaign as frothing-at-the-mouth neo-cons…. There are those who otherwise sing from the same hymn sheet as me on the other side of this debate.” Furthermore, Jones openly expressed his opposition to a ceasefire and called for Qaddafi—who in archetypal orientalist language he described as a “savage dictator”—to be overthrown. Deliberately or not, Jones habitually expressed his ostensible opposition to intervention in language that was largely indistinguishable from the warmongering propaganda of those most supportive of it. Although Jones stopped short of explicitly endorsing NATO’s war on Libya, through his refusal to condemn those who did (which included a plethora of figures on ‘the left’), his repeated demonization of Qaddafi and his perpetuation of the leader-focussed framing that is standardly used to encourage public support for imperialist wars against entire states (a topic I have written about in relation to Syria), he directly assisted in popularizing the mainstream narrative that, in turn, facilitated public support for NATO’s intervention. An intervention that, need we be reminded, caused the destruction of the Libyan state and has led directly to a litany of horrors including the return of slavery. The same is true of Syria, on which—short of calling for military intervention—Jones has uncritically followed the deeply misleading mainstream script. In a 2013 article, he even shoehorned in a comparison with Israel to its benefit, asking “if Israel’s cruelty was ‘barbaric’ and ‘horrific’” then what words were left to describe the actions of the “glorified gangster,” Bashar al-Assad? In 2015, while interviewing the Conservative Politician (and Steve Bannon ally), Jacob Rees-Mogg, Jones used overtly sectarian language while trying to convince Rees-Mogg that Bashar al-Assad needed to be deposed, claiming that Syria’s Sunni population “fear Assad more than they fear ISIS” and “would prefer to stick with them.” Underlining virtually all of Jones’ opposition to military intervention is his tacit endorsement of the myth of a well-intentioned West. He has repeatedly stressed that the results of interventions could be “disastrous” as though the intent of military action by the West would ever actually be to protect civilians or stop further bloodshed, thereby bolstering the false humanitarian premise by which Western imperialist aggressions are frequently justified. Jones’ interview with Campbell for GQ was not a one-off and therefore it cannot be dismissed as a naïve mistake. In September 2017, the two met again; Jones was the interviewer on this occasion and the result makes for similarly awkward viewing as their first encounter. Perhaps in response to criticism of the previous interview, Jones adopted a more combative approach the second time around, but it is one that he was barely able to maintain and once again, his respect for Campbell is evident throughout. Such is the low standard by which Jones is judged, he received praise merely for arriving late and making a joke at Campbell’s expense regarding poor planning and the war on Iraq. The mood throughout the interview is one of light-hearted joshing with occasional polite disagreements and appropriately, it ends with the pair shaking hands and sharing a joke. 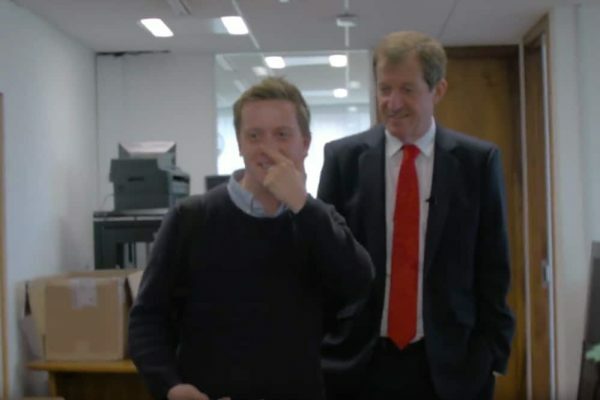 As Jones saw it, using language that makes it clear he is not concerned by the severity of Campbell’s crimes against the people of Iraq, “Alastair Campbell is a big boy. He can dish it out as well as he can take it. Which is what happens in both interviews.” The impression left by both interviews is that of a discussion between two individuals with essentially the same aims, but different strategic and tactical opinions about how to achieve them. When one considers that not only are both men resolutely part of the establishment, but are also members of the same political party, then perhaps this should not be a surprise. As part of the slightly more contentious approach he attempted in the second interview, Jones asked Campbell a number of questions related to the war on Iraq and Tony Blair (whom Campbell resolutely defends). However, the approach with which Jones opted to pursue his legitimate criticism of Blair was to compare the former Prime Minister’s lucrative work for the Government of Kazakhstan with Jones hypothetically working for Cuba, which in his words, “is self-evidently a dictatorship.” Unfortunately, this crude caricature of Cuba is representative of Jones’ stance more broadly. As Thomas Sankara once said, “Ballot boxes and an electoral apparatus in and of themselves don’t signify the existence of democracy.” Undoubtedly, certain political restrictions do exist in Cuba (in which country do they not? ), but critics such as Jones obscure the crucial fact that such limits are a direct response to the “unrelenting capitalist encirclement” that any non-capitalist state faces and their raison d’être is to safeguard the manifold gains of the revolution. Notwithstanding such constraints, the reality is that Cuba’s political system—one that listens to its scientists in order to plan for climate change and prioritises the health needs of the nation over profit—has a level of popular engagement in national decision-making that far surpasses the UK or the oligarchic U.S. As just one example, Yaffe noted that in 2011, the Guidelines for Updating the Cuban Economy were subject to four months of national consultation in which almost nine million people (from a population of just over eleven million) participated in discussions on the draft guidelines. Subsequently, 68 percent of the guidelines were modified according to these comments and many of the measures announced subsequently reflected that consultation process. Similarly, Cuba has recently begun preparations for three months of national meetings (more than 135,000 of which will be held in workplaces, schools, community centres and abroad), where all Cubans will be asked for their opinions and suggestions in advance of a constitutional referendum on changes including the imposition of term limits, the creation of a Prime Minister and allowing gay marriage. This is the dynamic, democratic and inclusionary nature of Cuba’s political system, that even though it faces ongoing imperialist aggression, Jones continually opts to use his enormous platform to demonise as a “dictatorship.” He can hardly be ignorant of this reality, which begs the question: why does Jones choose to obscure it? When Fidel Castro died in November 2016, Jones repeated the same spurious argument, stating that, “Socialism without democracy isn’t socialism: it’s unaccountable bureaucrats mixing paternalism with prisons and persecution.” Jones’ mention of prisons is ironic given the distinctly humanitarian nature of the Cuban justice system compared to the barbaric U.S. model and the collapsing system in the UK. He laughed at those critical of his stance and in response to someone comparing Castro to Pinochet and Hitler, Jones declared “Castro’s crimes should be condemned.” His response to my criticism at the time was simply that “people just have different opinions to you,” but this is not a question of opinions, but one of facts. In July 2018, Jones described Cuba as a “Stalinist experiment” and stated that he “rejects” it. Ironically, two days after expressing this rejection of Cuba, Jones praised Mandela and his endorsement of socialism. Mandela was an outspoken supporter of Castro and the Cuban Revolution and spoke repeatedly and at length about the “moral capital” that it had accumulated. Jones, on the other hand, presumably to project a ‘balanced’ image, has only written anything in praise of Cuba’s many achievements begrudgingly in articles that otherwise slander it as an authoritarian dictatorship. Perhaps the most obvious examples of Jones’ opportunism is his treatment of the Labour Party leader, Jeremy Corbyn. In February 2017, having already been highly critical of Corbyn’s leadership at a time when he was facing an onslaught of slanderous media attacks, Jones announced to The Evening Standard: “The Left has failed badly. I’d find it hard to vote for Corbyn.” Ironically, it was Jones’ employer, The Guardian, that that was then relentlessly attacking and ridiculing Corbyn perhaps more than any of its peers, a campaign in which the paper stooped so low as to publish an op-ed by the Israeli Ambassador to the UK, Mark Regev, which depicted the left (i.e. Corbyn) as anti-Semitic. Two months later, writing in The Guardian, Jones condemned Corbyn in vehement terms and all but called for him to stand down as leader in a scathing assessment that he then underlined in a video. Two weeks later, he explicitly called for Corbyn’s resignation and declared “my passionate and sincere view is Jeremy Corbyn should stand down as soon as possible.” Then, following Corbyn’s relative success in the General Election of June 2017, Jones immediately switched his stance and depicted Corbyn as a Prime Minister-in waiting. Corbyn’s unexpected victory as Labour leader in September 2015 was seemingly a golden—not to mention unexpected—opportunity for someone of Jones’ limp social democratic politics. However, Jones damaged his standing and credibility by his repeated attacks on Corbyn (when he was most in need of support) and his subsequent reversal of position only once he realised how incorrectly he had predicted the results of the election. For once, the cracks were starting to appear and Jones received significant criticism on social media for his transparent opportunism and lack of principle. Shortly after, Jones publicly praised Aaron Bastani of Novara Media (of whom he had previously been critical) and since then, Jones and members of Novara, notably Bastani and Ash Sarkar, have very publicly collaborated and supported one another. In what was possibly a quid pro quo—Novara’s perceived radical status and proximity to the Corbyn project in exchange for Jones’ vast media connections and huge following—both parties have subsequently benefited from the arrangement. Jones’ attacks against Corbyn appear to have been largely forgiven or forgotten and Sarkar in particular has been heavily promoted by Jones and the mainstream media over the past year. It was during a Novara talk with Sarkar entitled “Communism vs Socialism” (a title that by setting the two up as rivals implies a fundamental misunderstanding of the relationship between them), that Jones made his most recent disparaging comments on Cuba as discussed above. During the discussion, Sarkar—declared unironically by Jones the “heir to Karl Marx”—said little to imply that she does not share Jones’ left anti-Communist inclinations. A fellow contributor of Sarkar and Bastani to Novara is Paul Mason, who—almost uniquely amongst mainstream leftist journalists in the UK—has resolutely supported Corbyn. Unlike Jones, Mason makes very little attempt to hide the nature of his politics and in fact, he so frequently adopts indisputably right-wing positions that it is astounding he is able to maintain his reputation as a ‘leftist’ at all. Mason, who describes himself as a “Gramscian social democrat who supports nuclear deterrence,” is a reactionary imperialist and the main function of his attachment to the Labour Party under Corbyn’s leadership appears to be a barely concealed attempt to drag its already lamentable policy positions on a number of issues (notably immigration and defence) further rightwards. Mason has repeatedly declared his support for NATO and its dangerous expansion eastwards, a stance that he justifies on the fictitious basis that “the fascist war machine of Russia wants to destroy our democracy—and like in 1939 I would rather have democracy than fascism.” Let us be clear: NATO is an imperialist military alliance and ex-Nazi officers played a central role in its formation. Furthermore, it has been revealed that following the Second World War, NATO created a Europe-wide network of underground armed cells of fascists and conservatives (including former SS officers in Germany) that carried out false-flag terrorist attacks that were then blamed on Communist groups in order to discredit the left. Therefore, Mason’s portrayal of NATO as some kind of bulwark against fascism is not only absurd, but offensive. He has also alleged that Russia is waging “sustained hybrid warfare against British democracy.” This jingoistic, scaremongering rhetoric is illustrative of Mason’s position towards Russia generally, which unfailingly follows the UK Government line and regularly borders on the hysterical. Following the alleged Novichok attack in March 2018, Mason immediately endorsed a hyperbolic and evidence-free claim that it constituted a Russian “WMD attack” and cynically used it as an opportunity to call for an instant cancellation and reversal of all UK military defence cuts. He also expressed outrage that President Trump had voiced scepticism regarding the narrative set by Britain and argued that the claims of British intelligence services had to be accepted “on trust.” In fact, one of Mason’s central criticisms of Trump is that he is not sufficiently committed to NATO or the sanctions programme imposed on Russia. In a similar vein to Mason’s demonization of Russia, Jones has previously described it as being ruled by “a human rights abusing, expansionist, oligarchic regime,” a description which perfectly describes the U.S., yet Jones has never deployed such damning words against it. Putin, Assad, Hezbollah and all their cheerleaders in the alt-right and Stalinist left are already trying to smear the protests as pro-imperialist. The revolt shows, once again, that Stalinism is not a dead issue in the progressive movement, and that its remaining advocates want only an authoritarian “anti-imperialist” regime to support. It is not only what Mason is vocal about that is revealing; the issues that he chooses to remain silent on also reveal his transparently imperialist agenda. For instance, although an avid commentator on Twitter regarding a very wide variety of topics and countries, he has not made a single mention of the U.S.-backed coup in Honduras. Generally, however, what is remarkable, is not what Mason fails to mention, but the brazenness with which he makes the case for his deeply reactionary positions. Mason’s support for a stance that so openly disregards the inhabitants of the global south is perhaps not shocking when one considers that while BAE System’s personnel and equipment are directly complicit in war crimes in Yemen, Mason called for the government to give it state aid in order to halt job losses. “Dire news for Lancashire,” Mason exclaimed in response to the announced cuts, with no consideration for the unimaginable suffering of millions of Yemenis. Mason has also repeatedly expressed anti-immigration sentiment including a call for Labour to “temporarily suspend free movement.” In response to the Italian election results in March 2018, writing for Novara, Mason explicitly advocated imposing limits on immigration and perpetuated the dangerous notion of a hierarchy of migrant rights, arguing that “refugees have rights and so do economic migrants, but they are not the same rights.” To create such hierarchies is intolerable at any time, but to do so at a juncture in human history when unprecedented forced migration is set to take place (according to research cited by UNHCR, climate change may displace up to 250m people by 2050)—is truly reprehensible. Jones and Mason are merely the two most well-known figures representative of a much broader phenomenon; several other prominent left-wing commentators such as Jones’ fellow writer for The Guardian, George Monbiot, could have been profiled in this manner. Like Jones, Monbiot also publicly denounced Corbyn at his weakest moment, revealing himself incapable of supporting even a social democrat let alone genuine revolutionary change. As journalist Joe Emersberger has compiled, Monbiot has taken a number of regrettable stances in his career, including tacit support for the invasion of Iraq and has consistently been soft, at best, in regards to opposing imperialism. Most recently, Monbiot has attacked and slandered those who have rightfully questioned the mainstream narrative on Syria, including John Pilger, as “conspiracy theorists.” This attack came after Monbiot had outrageously praised a British al-Qaeda suicide bomber as a hero and compared the conflict in Syria to the Spanish Civil War. Given that most prominent contemporary proponents of the abstract notion of ‘leftism’ are neither anti-imperialist nor anti-capitalist, it is a struggle that unfortunately appears to have been largely successful. Indeed, it is testament to the success of this effort that principled opposition to imperialist wars is now frequently understood by many on the left as an extremist and “Stalinist” position that should be roundly condemned. Louis Allday is a PhD candidate at SOAS based in London. Follow him on Twitter @Louis_Allday.